From 1987-89 Perez was a law clerk for Judge Zita Weinshienk of the U.S. District Court in Colorado. In the early 1990s he served as a prosecutor, and later as deputy chief, in the Civil Rights Division (CRD) of Bill Clinton‘s Department of Justice (DOJ). From 1995-98, Perez worked as special counsel to Senator Edward Kennedy. From 1998-99, Perez returned to the DOJ’s Civil Rights Division as deputy assistant attorney general. In this role, he helped establish the Worker Exploitation Task Force, which sought to improve the working conditions of illegal aliens. Moreover, he worked to eliminate the disproportionate assignment of black and Hispanic students to special-education programs; to increase the number of such students in “gifted and talented” programs; to prosecute federal civil-rights cases involving police misconduct and hate crimes; and to eliminate racial profiling by law-enforcement. Also during his tenure with the Clinton DOJ, Perez volunteered for—and later (from 1995-2002) became a board member (and president) of—Casa de Maryland, a George Soros–funded advocacy group for illegal aliens. As a member of Maryland’s Montgomery County Council in 2003, Perez (who served on the Council from 2002-06) called for the state to recognize the notoriously fraud-prone matricula consular ID cards issued by Mexican and Guatemalan consular offices as a valid form of ID for illegal immigrants in the United States—even though allowing such IDs could give illegals easier access to government-funded social services. That same year, he sponsored a Montgomery County bill aimed at giving illegal immigrants access to banks. In 2008 Perez worked on Barack Obama’s presidential campaign and then served on the transition team after Obama’s electoral victory. On March 31, 2009, President Obama nominated Perez to be Assistant Attorney General for the DOJ’s Civil Rights Division (CRD). The U.S. Senate confirmed Perez in October 2009. On April 23, 2012, Perez’s Justice Department sued the city of Jacksonville, Florida, claiming that its use of written tests to determine promotions in its fire department had “resulted in a disparate impact upon black candidates,” who registered passing grades at significantly lower rates than their white counterparts. “This complaint should send a clear message to all public employers that employment practices that have the effect of excluding qualified candidates on account of race will not be tolerated,” said Perez. In Perez’s view, compensatory payments to plaintiffs who win judgments in civil-rights cases should go not only to the actual victims of discrimination, but additionally to “qualified organization[s]” approved by the Justice Department. Such a policy enables DOJ to funnel cash into the coffers of activist groups that share the presidential administration’s political agendas. That same year, Perez and CRD launched an investigation of Maricopa County, Arizona sheriff Joe Arpaio, known for his strict enforcement of federal immigration laws. This investigation grew out of a February 2009 demand—by Democratic Representatives John Conyers, Zoe Lofgren, Jerrold Nadler, and Bobby Scott—that the Justice Department look into allegations of Arpaio’s “discriminatory” police practices toward illegal aliens. Though the accusers had no evidence of any wrongdoing by Arpaio, CRD initiated its inquiry within a month. In 2010, Perez would lead the Obama Justice Department in filing a lawsuit against Arpaio. On April 20, 2010, Perez testified before the Senate Judiciary Committee on the subject of his efforts to combat discrimination in housing, money lending, employment, and police work. Perez played a key role in opening investigations of several large urban police departments for systematic civil-rights abuses such as harassment of racial minorities, false arrests, and excessive use of force. In 2011, for instance, Perez’s CRD initiated a high-profile push to reform the New Orleans Police Department; “pattern and practice” investigations of police departments in Newark and Seattle; and a preliminary investigation of the Denver Police Department. These actions were consistent with what Perez had stated in September 2010: “In case you haven’t heard, the Civil Rights Division is once again open for business. There were very few [pattern and practice] cases during the prior administration.” On another occasion (in April 2010), Perez had stated: “Criminal prosecutions alone, I have learned, are not enough to change the culture of a police department.” As of March 2013, Perez had initiated 17 probes of police and sheriff’s departments across the United States—more probes of that type than CRD had ever previously conducted under any individual’s leadership. In 2011, Perez led a DOJ lawsuit against Alabama’s recently passed anti-illegal immigration law (HB-56), similar to Arizona’s 2010 law. In August-September 2011, PJ Media published Every Single One, a 12-part series of exposes revealing that, without exception, every attorney hired by Perez’s CRD had a leftist or Democrat activist pedigree. When PJ Media initially asked to see the resumes of these hires, the Justice Department refused to provide them. Thus PJ was forced to sue Attorney General Eric Holder in federal court under the Freedom of Information Act, and thereby gained access to the data it sought. To view this 12-part series, click here. By Perez’s reckoning, voter ID laws are racist constructions calculated to deprive nonwhites of their voting rights. Indeed, Perez led the Obama administration’s assault on voter ID laws during the run-up to the 2012 elections. Perez also led a 2012 CRD lawsuit that succeeded in overturning Texas’s voter ID law. In late May 2012, Perez and DOJ ordered the state of Florida to halt its efforts—which were already underway—to verify the identity and eligibility of the people listed on its voter rolls. DOJ explained its actions by saying that it had not yet been able to verify that Florida’s efforts “neither have the purpose nor will have the effect of discriminating on account of race, color, or membership in a language minority group.” In a letter (dated June 11) to the Florida Secretary of State, Perez charged that Florida was violating the National Voter Registration Act and the Voting Rights Act. “Please immediately cease this unlawful conduct,” he wrote. Florida was not compliant with DOJ, however. “We have an obligation to make sure the voter rolls are accurate and we are going to continue forward and do everything that we can legally do to make sure than ineligible voters cannot vote,” said Chris Cate, a spokesman for Florida secretary of state Ken Detzner. “We are firmly committed to doing the right thing and preventing ineligible voters from being able to cast a ballot. We are not going to give up our efforts to make sure the voter rolls are accurate.” Earlier that year, Florida election officials had identified some 53,000 still-registered voters who were deceased, and another 2,600 who were non-citizens. In fact, state officials estimated that the total number of non-citizens on Florida’s registered-voter rolls was as high as 182,000. Nevertheless, DOJ filed suit against Florida on June 12, 2012. “Because the State has indicated its unwillingness to comply with [DOJ’s] requirements, I have authorized the initiation of an enforcement action against Florida in federal court,” said Perez. In February 2012, Perez had used his influence to prevent the U.S. Supreme Court from hearing Magner v. Gallagher, a case where local slumlords from St. Paul, Minnesota were accusing that city of racism for enforcing its housing code. St. Paul, in turn, challenged the notion (embraced by Perez) that racial discrimination can be proven simply by presenting disparate-impact statistics rather than actually ascertaining intent or examining the specifics of each case. As the Court date drew near, St. Paul officials, confident of a victory, publicly declared that they would prove that the Fair Housing Act actually makes no explicit allowance for disparate-impact analysis. 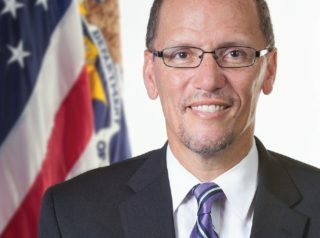 Perez, afraid that the Court might rule disparate impact illegal, spoke to representatives of both St. Paul and the plaintiff and, according to the Wall Street Journal, “strongarm[ed]” them to withdraw the case so that he and the Justice Department could continue filing such lawsuits. The Ocean County Register reports that “as a quid pro quo for withdrawing its case, Mr. Perez promised the city of St. Paul that Justice would make two pending False Claims Act cases it was facing go away,” thereby saving the city “millions of dollars” in legal fees and settlement costs. In a May 2013 hearing before members of the House Oversight and Judiciary Committees, Perez testified that he could not recall ever having used his personal Verizon email account to conduct Justice Department business at his Takoma Park, Maryland home. This was an important matter because — in the interests of transparency — it is illegal for government employees to conduct government business on a personal email account. Perez was then confronted with emails showing conclusively that he had in fact conducted DOJ business on his home Verizon account, and he conceded their authenticity. Under Perez, the DOJ repeatedly slow-walked efforts intended to help ensure that overseas military personnel (who tend to support Republican candidates by a wide margin) could exercise their voting rights. Meanwhile, Perez’s division strove—without jurisdiction—to help felons (who overwhelmingly support Democratic candidates) regain voting privileges in a number of states. On February 25, 2017, Perez defeated Minnesota Rep. Keith Ellison by a margin of 235 votes to 200, in a race for chairman of the Democratic National Committee. Perez’s victory came in the second round of voting, after he had fallen one vote short of winning in the first round. 1 It is noteworthy that in 2005, the DOJ itself had approved a Georgia law with the same provisions and protections, and in 2008, the Supreme Court ruled 6-3 in Crawford v. Marion County Election Board that an Indiana law requiring photo ID did not present an undue burden on voters. Furthermore, South Carolina’s law explicitly addressed potential disenfranchisement by offering state-issued IDs free of charge, and free transportation to anyone who needed a ride to a location where a picture ID could be obtained. An extensive data review conducted by Department of Motor Vehicles Director Kevin Shwedo found that more than 900 deceased people had “voted” in recent elections in South Carolina, demonstrating that a voter ID policy could have been useful in South Carolina.